Smith wins four Grammys at the 57th awards show including best new artist, song of the year and record of the year for Stay with Me, and best pop vocal album for In the Lonely Hour. Before I made this record I was doing everything to try and get my music heard. I tried to lose weight and I was making awful music. It was only until I started to be myself that the music started to flow and people started to listen. Rihanna wins Grammy for Best Dance Recording for Only Girl (In The World). Thanks for letting us accept this. Thank to these guys we made the record with. Miguel wins Grammy for Best R&B Song for Adorn. Harris and Rihanna wins Grammy for Best Short Form Music Video for We Found Love. 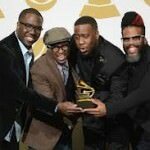 Robert Glasper Experiment wins Grammy for Best R&B Album for Black Radio. I don’t have any boundaries when I do music. I totally let the music lead me so I’m interested to see where it takes me because I don’t know, and I don’t want to dictate it. Brickell and Martin, songwriters, win the Grammy for Best American Roots Song for Love Has Come For You. Paquito D’Rivera and Trio Corrente wins Grammy for Best Latin Jazz Album for Song for Maura. 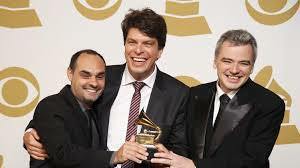 We dedicate this award to many Brazilian musicians. Schneider wins the Grammy for Best Contemporary Classical Composition for Schneider, Maria: Winter Morning Walks. Thank you to everyone who supported making this record. Timberlake is the Grammy nominee for Best Pop Vocal Album for The 20/20 Experience-The Complete Experience. Through the night and next day we received so many nice messages and congratulations from friends and family everywhere. It made me realize that the GRAMMYs is an award that not only musicians and the music industry recognize, but people everywhere! We can’t wait to attend the event on Jan. 26 — it’s a real honor and humbling experience for us all to be nominated and recognized among so many of our talented peers. Garrett is a Grammy nominee for Best Jazz Instrumental Album for Pushing The World Away. Syntek is a Grammy nominee for Best Latin Pop Album for Syntek. I get really shocked and still shocked. I am very happy. The Milk Carton Kids are Grammy nominees for Best Folk album for The Ash & Clay. Armstrong is a Grammy nominee for Best Score Soundtrack For Visual Media for The Great Gatsby. Wilentz is a Grammy nominee for Best Album Notes for 360 Sound: The Columbia Records Story. Järvi is a Grammy nominee for Best Orchestral Performance for Atterberg: Orchestral Works Vol. 1. Thomas Newman, composer and producer, Bill Bernstein, producer, Simon Rhodes, engineer/mixer wins Grammy for Best Score Soundtrack For Visual Media for Skyfall. Thank you to everyone involved with Skyfall the soundtrack. Lorde wins a Grammy for Best Pop Solo Performance for Royals. Warwick is a Grammy nominee for Best Traditional Pop Vocal Album for Now. Morton is a Grammy nominee for Best R&B Song for Only One. Swift is a Grammy nominee for Best Country Song for Begin Again. Maher is a Grammy nominee for Best Gospel/Contemporary Christian Music Performance for Lord, I Need You. "I'm on a boat" got a Grammy nomination??? Oh, the irony. Los Angeles Azules is a Grammy nominee for Best Tropical Latin Album for Como Te Voy A Olvidar. Ladysmith Black Mambazo wins a Grammy for Best World Music for Live: Singing For Peace Around The World. 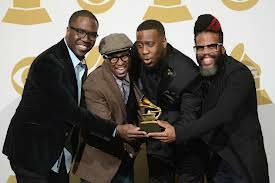 This is their fourth Grammy. 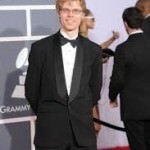 Owen is a Grammy nominee for Best Instrumental Composition for Bound Away. Rechtshaid is a Grammy nominee for Producer Of The Year, Non-Classical. Lewis and Wells wins Grammy for Best Chamber Music/Small Ensemble Performance for Roomful Of Teeth. 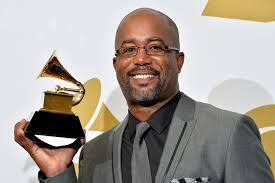 Rucker wins Grammy for Best Country Solo Performance for his song Wagon Wheel. I am just a kid from outside with a dream. I’m not even supposed to be here. Thank you. I’m honored to announce…Grammy nomination for Best Pop Duo/Group for “Stay“…So excited. Thanks for all your love and support, guys. It means the world. We are ecstatic, surprised and very happy! Eminem is a Grammy nominee for Best Rap Performance for Berzerk. Blanchard is a Grammy nominee for Best Improvised Jazz Solo for Don’t Run. Cobbs is a Grammy nominee for Best Gospel Album for Grace [Live]. Dailey and Vincent are Grammy nominees for Best Bluegrass Album for Brothers Of The Highway. Ferguson is a Grammy nominee for Best Comedy Album for I’m Here To Help. Roettinger is a Grammy nominee for Best Recording Package for Magna…Holy Grail. Lindberg is a Grammy nominee for Best Engineered Album, Classical for Hymn To The Virgin. Harris and Crowell win a Grammy for Best American Album for Old Yellow Moon. 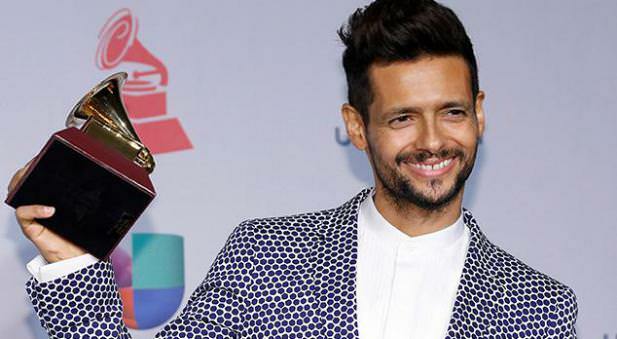 Rosa wins Grammy for Best Latin Pop Album for Vida. Lorde is a Grammy nominee for Record of the Year for Royals. Even being nominated is so incredible. What a good night! I debut my next single on Annie Mac BBC Radio 1 and ‘Need U (100%)‘ ft A.M.E & MNEK gets nominated for The GRAMMYs! Tame Impala is a Grammy nominee for Best Alternative Music Album for Lonerism. Lamar is a Grammy nominee for Best Rap Album for Good Kid, M.A.A.D City. 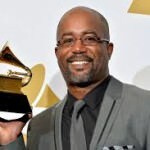 Christian McBride Trio is a Grammy nominee for Best Jazz Instrumental Album for Out Here. Torres is a Grammy nominee for Best Latin Pop Album for 12 Historias. Strachwitz is a Grammy nominee for Best Folk Album for They All Played For Us: Arhoolie Records 50th Anniversary Celebration.